A screening of the film Spectacle: A Portrait of Stuart Sherman (2013) by artist Robin Deacon followed by a discussion between Deacon and artist Joshua Sofaer. Spectacle: A Portrait of Stuart Sherman, Deacon’s first full-length feature film, represents a major departure from his established practice. It includes Deacon’s re-enactments of Sherman’s work, as well as exclusive interviews with his colleagues, collaborators and friends. This event is a great opportunity to hear two of Britain’s most exciting live artists, reflecting on the legacy of the late Stuart Sherman – an underexposed, but hugely influential, figure in the history of performance art. Robin Deacon (born 1973) is an artist, writer, film-maker and educator based in the USA, whose performances and videos have been presented nationally and internationally including at the Institute of Contemporary Art, London and The Centre for Contemporary Culture, Barcelona. 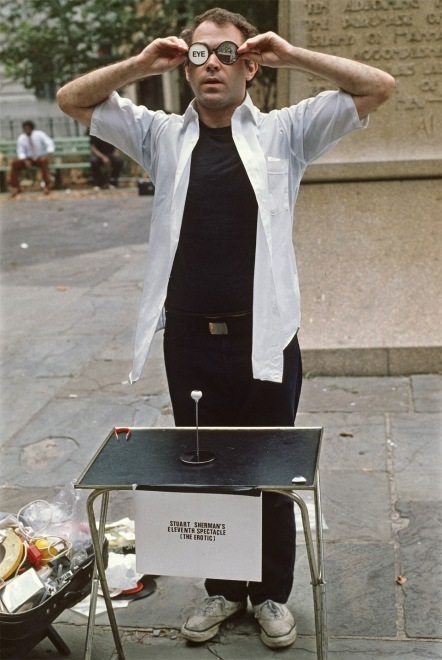 As a performer, his work explores artist biography as well as journalistic and documentary approaches to art-making. Past awards include the Arts Council England International Fellowship Award, The Live Art Development Agency Bursary (2002 – 2003) and the Franklin Furnace Inc. Fund (2012 – 2013). Deacon is an Assistant Professor in Performance at The School of the Art Institute of Chicago, USA. Joshua Sofaer (born 1972) is an artist whose practice is concerned with modes of collaboration, participation and humorously playing with established forms of production. After obtaining a BA in Drama and English at Bristol University, he went on to complete an MA in Fine Art at Central Saint Martins College of Art & Design and was subsequently awarded a PhD from Dartington College of Arts. Past works include Scavengers (Tate Modern, London; SFMOMA, San Francisco; Edinburgh Festival) and Object Retrieval, a Wellcome project for UCL that was nominated for a 2010 Museum & Heritage Award for Excellence. Sofaer was a winner of the 2009 Bank of America CREATE Art Award and was the first Artist Fellow on the 2010/11 Clore Leadership Programme.